In this world where friends fail us and we miss the mark, whether in school or on the field, kids need a rock to depend on. 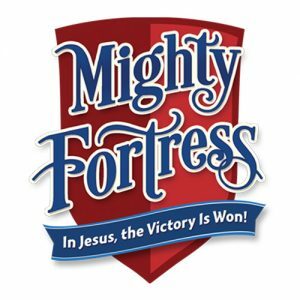 In Mighty Fortress VBS, they’ll find themselves in a medieval castle to learn that God will be their refuge and strength – the foundation, fortress, and defense they can rely on! In Jesus, the victory is won! BIBLE POINT: Victory is won!! Your students will shout this truth again and again as they hear true stories of God’s might. Each day throughout VBS, they’ll learn that He alone is their mighty fortress. On Day 1, the story of Joshua leading the Israelites to victory over Jericho illustrates that “God is mighty.” Day 2 introduces kids to King Hezekiah and his story of faith in the face of danger declaring “Fear Not!” Kids learn on Day 3 that “God’s Word is true and powerful” through the story of King Josiah and his rediscovery of God’s Word. King Jesus enters Jerusalem on Day 4 proclaiming the truth that “Jesus comes to save.” At last, your kids will hear of Jesus death and resurrection on Day 5 and learn that “Jesus is our Savior King!” The realistic illustrations continue the theme that these are not fairy tales, but true stories of true events that God used to show each of this that He is victorious. TOURNAMENT GAMES: It’s not medieval times without a tournament. Mighty Fortress takes the cue and offers some of the coolest games around. The games makers at Concordia Publishing House invented some awesome, high-energy activities that are sure to make your kids break a sweat, cheer one another on, and drive home the lessons of each day. With games named “Launch It,” and “Fortress Ball,” you can’t go wrong. PRO-TIP: Your teens need a place to serve and VBS games are one of the best ways to get your church’s youth involved in service. They’ve got tons of energy, they’re available in the Summer, and the elementary aged kids look up to them… big time! And teens who get involved in serving at church feel useful and need, and they’re likely to remain involved in church into their college years. Choose your template or get a custom design! 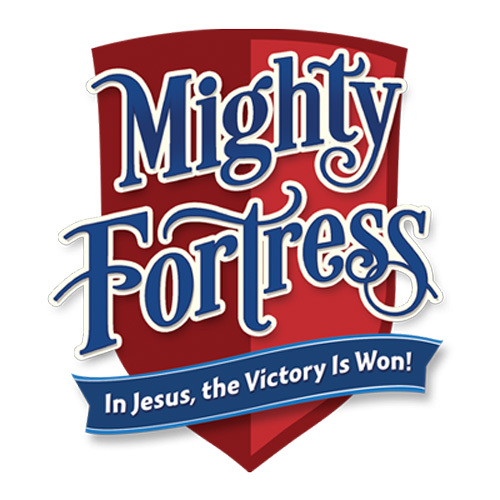 Great Hall Snacks – Every VBS curriculum gets creative with the snacks, but Mighty Fortress takes the cake. From the “Tumbling Walls” cheesy toast to the “Jerusalem Road” fruit tart, we’re getting hungry already! Fortress Decorating – Mighty Fortress gets the “total immersion” award for their fortress decorating kits and ideas. Who would have thought recreating the interior of a gothic castle inside the Sunday School room would be so easy and effective? Grab those creative volunteers and get to work! Purchase your copy of Mighty Fortress from Concordia Supply HERE.